As a rule of thumb, if The Guardian's Peter Bradshaw really hates a film, it will have mainstream appeal and be thoroughly enjoyable. It should, then, come as no surprise that Mr Bradshaw hated Goodbye Christopher Robin. It's not an Eastern European four-hour epic about the struggle for bees in an industrialised world starring one man and a tractor and dubbed into Italian. Instead, it's the story of A. A. Milne and how he came to write the Winnie The Pooh stories. Now, as with IT, I come at this from a personal place - I had these stories read to me as a wee nipper, and then I read them myself when older. And they are magical. Full of hope, happiness, imagination, wisdom, and - in the final story - touching poignancy and sadness. But the story behind the stories is not quite so soft and squishy. A. A. Milne and his illustrator E. H Shepherd (played perfectly by Domhnall Gleeson and Stephen Campbell Moore respectively) were both suffering from PTSD following action in the First World War. While struggling to find the words to fight for peace, Milne decamps to the country with his wife and newborn son. Through forced circumstances, Milne has to spend time with his son, and so the tales are born. And this is just one of the hidden gems within this film. Throughout the midsection, events occur whereby the fan of Pooh can spot events that lead to the stories - and that just gives you a lovely, warm feeling inside. There is also a scene where Milne and son stare out over a vast landscape, and you can almost feel the tranquillity pouring off the screen. It's possibly the most relaxing moment we've ever experienced in a cinema. But don't make the mistake of thinking, as Bradshaw did, that this is a saccharine tale of a childhood legend. As with the books, there's a darker underbelly lurking. For a start, the PTSD flashbacks are sudden and shocking - much as Milne would have experienced - and appear with no warning. They are brilliantly handled and serve to remind us what survivors of The Great War had to live with. Then there's CR's mother, Daphne. To say she doesn't come out of this film well would be understatement - and it's a measure of just how good Margot Robbie's portrayal is that you pretty much hate her from the birth onwards. That's not to say the woman didn't have her good qualities - but it's in seeing these that highlight her selfish core. In fact it was she that pushed the publicity side of things, robbing her son of a large chuck of his childhood. I still can't quite believe just how good Robbie was in this role - and I say that as someone who has admired her for a while. Milne was to blame too, of course, and Gleeson portrays the guilt and inner-conflict well. But CR was blessed, kind of, to have three parents. With his nanny Olive (Kelly MacDonald in another fine performance), CR had at least one person who gave him love and attention. 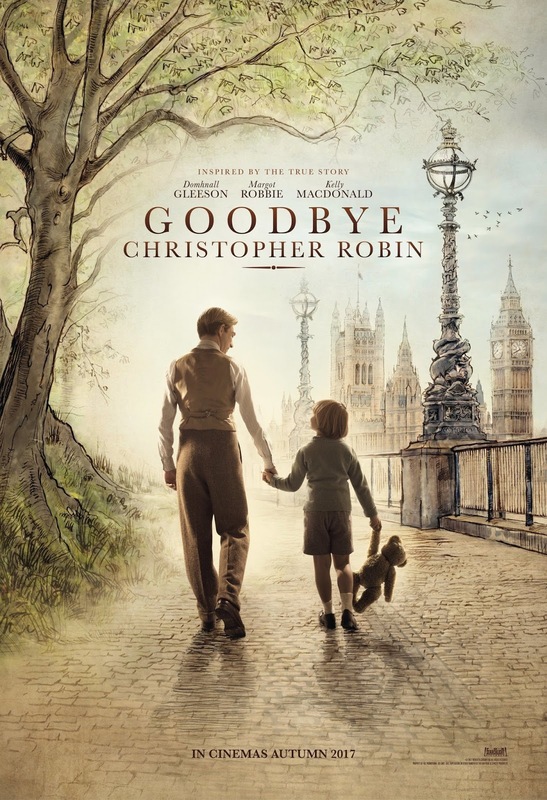 If I'm giving the impression that Goodbye Christopher Robin is somehow a harsh depiction of childhood, forgive me. What director Simon Curtis and writers Frank Cottrell Boyce and Simon Vaughan have concocted is a bittersweet, moving, gentle, beautiful tale of how a Bear came to Be and how it affected those around him. It's warm glow, gentle pacing and note-perfect narrative all combine to create a world you don't want to leave. And a world that couldn't be without one special boy. In Will Tilston, the producers have uncovered a very, very talented young man. You connect with him instantly, and you share his ups and downs as he tries to grow up with the world eventually watching. It's a performance of maturity way beyond his tender years. And that, in a way, encapsulates everything that was good about the Pooh books. They were a simple thing, but worked on several levels and reached an audience far greater than anyone could have imagined. Certain critics (hi, Peter) may have been sniffy about this film - but when you're swept up from the start and you don't want it to end (and even digital projection issues fail to ruin that feeling), that is surely the mark of a great, great film.